I love TED. I love it because when I have a few free minutes I can learn about no end of fascinating things. But I love it even more because sometimes TED brings me moments of mind-boggling delight. Here is one of them. It is a human kaleidoscope celebrating the “Power of X” to multiply great ideas. Watch the TEDxSummit intro video: The power of x. But it gets even better. You can see how the video was made. There were no camera tricks, just mirrors, angles, creativity, and very clever planning. So how do we use this wonder in school? How about using it while studying light? Have students create three-sided mirror “tubes” that are small versions of the one used in The Power of X. Experiment with arranging objects and predicting what they will look like through the kaleidoscope. Have students use principles of reflection and refraction to explain what they are seeing. In PE, use the video to inspire a synchronized (swimming) routine–either in the water or on the gym floor. 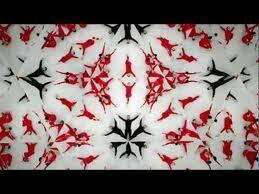 In math, use the video to study lines of symmetry. In a second viewing, stop the video periodically and have students identify the various ways in which symmetry appears. Have students create images with multiple lines of symmetry. Imagine being one of the figures in the video. What would it be like, living in a world in which all movements are synchronized that way? How would it feel? Younger students could write imaginative stories. Older students could practice creating alternate (possibly dystopian?) realities, in an exercise that simulates the roots of some science fiction. I just know you’ll come up with even more ideas. What are they? « Teachers, Stress, and Creativity: Are We Really Afraid?